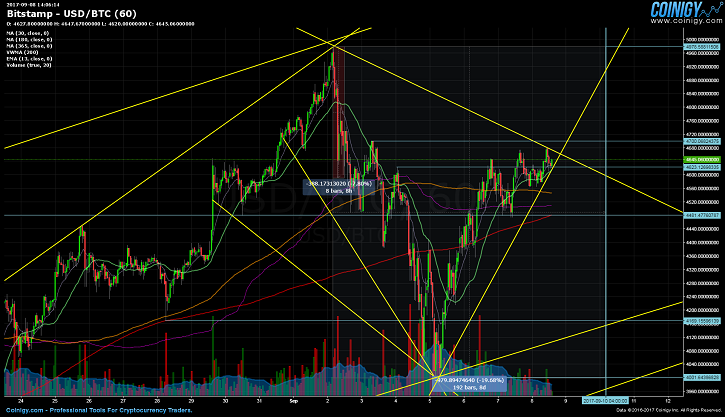 Dropping volume on the hourly, has driven the price of bitcoin into somewhat of a sideways trading range. The remainder of the day will shed more light, as to whether this ends up being the first step to $5,000 and beyond, or yet another vicious about-face reversal toward the $4,001.93 weekly low. The parabolic growth of bitcoin, has born witness to countless governmental regulatory proposals, most of which continue to be oppressive in nature. From talks of banning bitcoin mining outright in Russian homes, to the ICO prohibition in China, there have been occasional positive examples of regulation and governance when tackling fintech issues. Such is the proposed Cryptocurrency Tax Fairness Act currently up for debate in the USA, urging for tax exemptions on crypto currency transactions that fall under a $600 threshold. Representatives Jared Polis and David Schweikert are spearheading the proposal, who are both incidentally co-chairs of the Blockchain Caucus within the US Congress, one of the more influential American pro-blockchain institutions. It is no wonder that many national and local governments from across the globe, are trying to catch up with the new wave of crypto investments, which seem to function as a strong catalyst for further economic growth. Chiasso, a Swiss municipility has moved ahead of the mainstream, by accepting tax payments that total up to 250 CHF, at the bitcoin market exchange rate. This is the first case, in which a regional tax authority has suggested a comparable arrangement. In just the last few months, eight start-ups have secured and moved their headquarters to the canton of Ticino, where Chiasso is located. However, despite it all, bitcoin is not without its faults or long standing myths for that matter. More decentralization could be in store for bitcoin in the coming months. Japanese GMO, an internet focused conglomerate, has revealed plans for long-term expansion into the bitcoin mining space. The base of operations is to be located in Northern Europe, where high quality mining components and renewable energy is readily available. On a similar note, Bitmain has engaged Sequoia Capital and IDG Capital in order to raise $50 million from numerous venture firms. The race to for better and larger hash rates is not limited to bitcoin though. Litecoin may have a bright future ahead of it, at least according to the latest article from Market Mogul. Either way, we can expect volatile price movement until the uncertainty regarding the November bitcoin hard fork is resolved. I think my previous poll wasn't very clear. Let's try a simple one. Do you support Bitcoin hardforking in November to double the blocksize? The $4,001.93 weekly low was established on September 5 (GMT 04:00). The ensuing 3 days, have seen a forceful rise in price that could soon continue to break ahead of the $4,979.9 weekly high, which is also the ongoing monthly and all-time high as well.